Colors and Types of a Tiny Yorkshire Terrier (also known as miniature Yorkshire Terriers, Teacup Yorkshire Terriers, mini Yorkies, micro Yorkies and Toy Yorkies). When we talk of a Yorkie, we tend to imagine a two-color dog, either black and tan or tan and silver, which is also called blue, but there are others. In 1984 a piebald Yorkie was born, resulting from a genetic recessive gene occurrence from two Yorkshire Terriers. The Biewer Yorkie is recognized as a breed on its own now. Purely because of its white colored banding, this disqualifies it from the status of Yorkshire Terrier. You may have heard the term ‘parti’ Yorkie. This is a purebred Yorkshire Terrier who simply has a different hair color from the norm due to the recessive piebald gene. This coloring can include white, black and gold, but the coat must be at least 30% white to be considered a true ‘parti’. 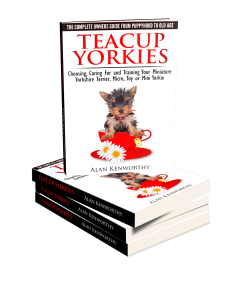 White Teacup Yorkies are very sought after. The general rule is that a purebred Yorkie or Biewer Yorkie who is more unusual in color will probably be more expensive due to their rarity. 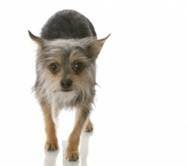 As a purebred, their personality will be predominantly Yorkie and the care and attention exactly the same. So it is just a case of asking yourself whether you want to pay more for coat color. You can find other information on Teacup parti Yorkies on our other pages covering: adoption, accessories, clothes, care, cost, growth chart, names, health, information and facts, jewelry, lifespan, outfits, rescue, adoption, temperament, YouTube videos and weight chart.